The Host Milan show is known for its many extravagant displays from its thousands of exhibitors within over 14 pavilions. From fresh gelato samples to giant beverage coolers, this show has it covered. Click here for more details. A New Zealand McDonald’s location has taken on a variety of changes as the chain’s restaurant of the future. Featuring a McCafe, high-speed internet for customers, an open kitchen and a gourmet bar. Click here to learn more! McDonald’s locations in Germany have announced the availability of the ‘McB,’ a 100% organic burger, to hopefully attract consumers conscious of their health. Click here for more details. ‘Tis the season for sweet indulgence and festive decor! Anyone can bake a decadent dessert in a glass dish, springform pan, or even a mug these days. However, when cooked in a skillet most cookies, brownies and cakes tend to have a softer center due to a larger size, while still maintaining a perfectly browned edge. ACP Corporate Chef Sandy Gibilisco’s recipe for Santa Size Red Velvet Dessert is the perfect example of utilizing a cast iron skillet for sweet indulgence during this holiday season. A core value at ACP is commitment to continuous improvement in all that we do. We are happy to announce a few product improvements to the HDC and MDC models. New high temperature ceramic tray with molded gasket that replaces current RTV sealant around the tray. The oven will be simpler to service because the tray can be removed with a commercially available suction cup tool, no more cracking trays and replacing with messy RTV applications! Please note: New trays cannot be installed into HDC/MDC ovens already in the field. Click here for a list of p-numbers for each model chassis to help determine which units in inventory feature this change. The stainless steel interior has been upgraded from 300-series to 400-series to increase absorption of microwave energy by cavity walls. If the oven is run for extended periods of time with no load or a very light load, the walls will heat up faster than they currently do, tripping the resettable TCO (thermal cut-out) and shutting down the oven. This change was made to prevent damage to the magnetron and other components. With this change, once the walls cool down again, the oven will return to normal operation. The energy absorption by cavity walls has no effect on cooking performance. 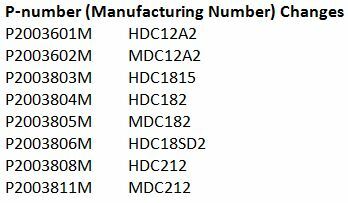 Blue dots are being placed on HDC and MDC boxes that feature these upgrades, to assist in quickly identifying new units in inventory, in addition to the p-number changes outlined above. An LED light replaces the current incandescent lamp for superior cavity illumination. The LED light outlasts the incandescent bulb by 20x – up to 50,000 hours – reducing the need for service and replacement. As a result of this change, the service panel currently located on the left side of the oven will be removed, streamlining the overall appearance of the oven cabinet. ACP is pleased to announce a number of organizational changes in the sales and marketing department and engineering and service departments, effective immediately. It is our hope that these adjustments will better position the company in accomplishing key goals moving forward. Mary Potter, Senior Vice President – Sales and Marketing, continues to lead our sales and marketing activities globally, with increased focus on growth opportunities at home and abroad. She and her team will manage sales and business development including pricing, trade shows, sales promotion, marketing sales communications and a new enhanced sales support program. Allyson Miller has been promoted to the new position of Sales Development Administrator, reporting to Mary Potter. Allyson will support our sales training and development initiatives, as well as administering MAP and special programs. Jessica Payne has been appointed to the position of Sales Communications Administrator, reporting to Mary Potter. Jessica will continue to be responsible for trade show participation and exhibitions, as well as design and development of sales support materials, communications and website. Al Brown will continue to handle global parts sales and will also be supporting international sales business in the Middle East. Al will continue reporting to Mary Potter. Mary Solyntjes now reports to Mary Potter in her role as Manager – Sales and Marketing Services with a new assignment to administer price change requests from the sales organization. Ann Ewoldt continues to manage the global product line, brand language, website templates and advertising. She has a new role managing all our IT vendors and programs, including development of new business intelligence and document/process management systems. Her new title is Director of Marketing and Business Intelligence and reports to Tim Garbett. The following adjustments will help to directly connect engineering to the impact of their equipment designs on the customer ownership experience. Joe Fisette and the field service delivery team are now under the direction of Mike Groen, Director of Engineering and Service, as of the beginning of the new fiscal year. Mike will be leading the design engineering and field service teams. Bob Schulte has been promoted from Senior Design Engineer to Project Design Engineer. Ed Cook has been appointed to the position of Manager-New Product Development, reporting to Mike Groen. Reporting to Ed will be Derek Lehman, Senior Design Engineer; Tom Miller, Project Design Engineer; and Bob Schulte, Project Design Engineer. Patrick Henry will be assisting with agency project management in addition to his warranty administration duties and will continue reporting to Mike Groen. Beginning in December, all 60 Hz Menumaster® Commercial product will feature a new ComServ service support number on product labels and doors. The number will ring directly to our ComServ team bypassing all phone prompts and taking priority over all other incoming calls. Callers will receive direct, live customer service in Cedar Rapids, Iowa. The new number is 1-866-811-8559. Please note: this change only affects Menumaster® Commercial branded product. All Amana® Commercial product will still feature the 1-866-426-2621 ComServ number. That number will remain valid and functional in addition to this new 1-866 number. As with all other ComServ calls, if the call is received after normal business hours (M – F, 8 AM – 4:30 PM) it will transfer to our overflow service center. The call may also be transferred if all ComServ representatives are already busy. Information will be relayed from the overflow center to the ComServ team for action as soon as possible.